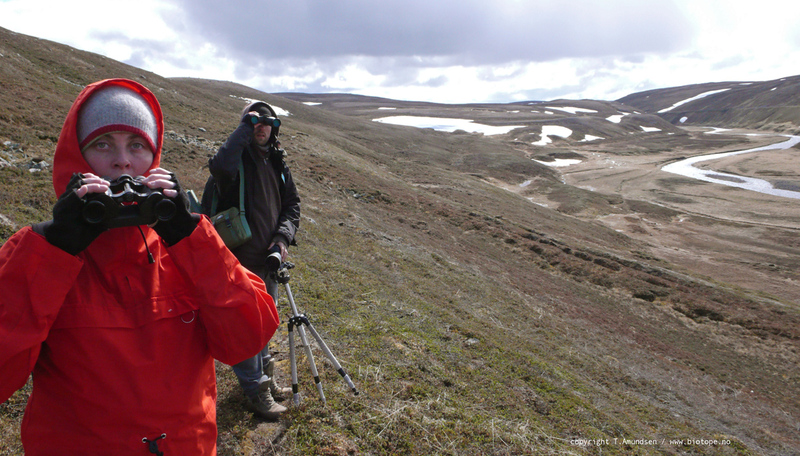 For almost three years we have been travelling around the eastern parts of Finnmark, or ´Arctic Norway´ - the birder term for this region. 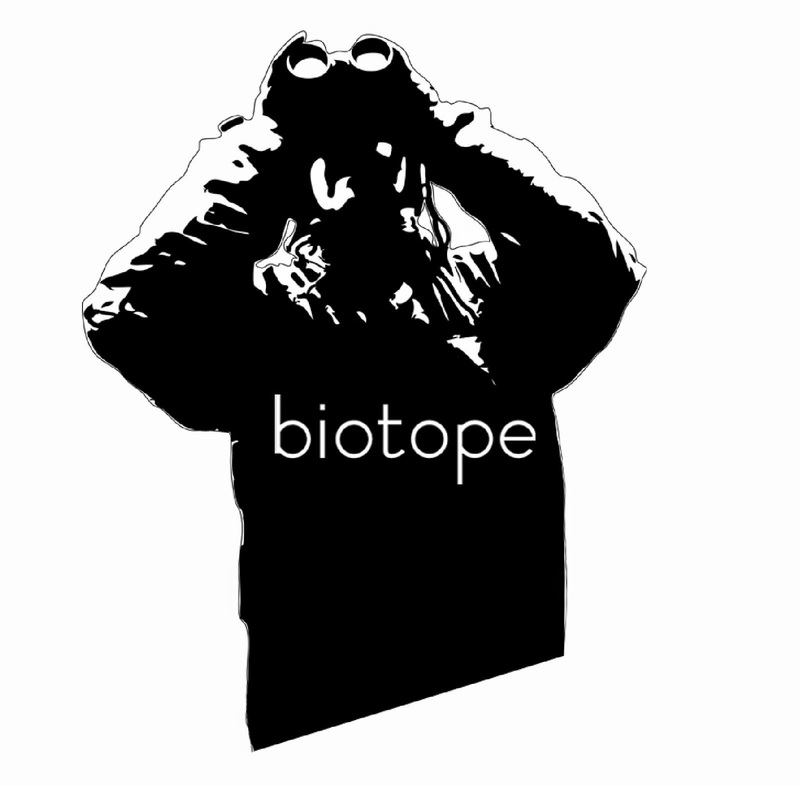 We are mapping and registrating the birdlife, the bird sites and the infrastructure, the guest houses and towns, etc. 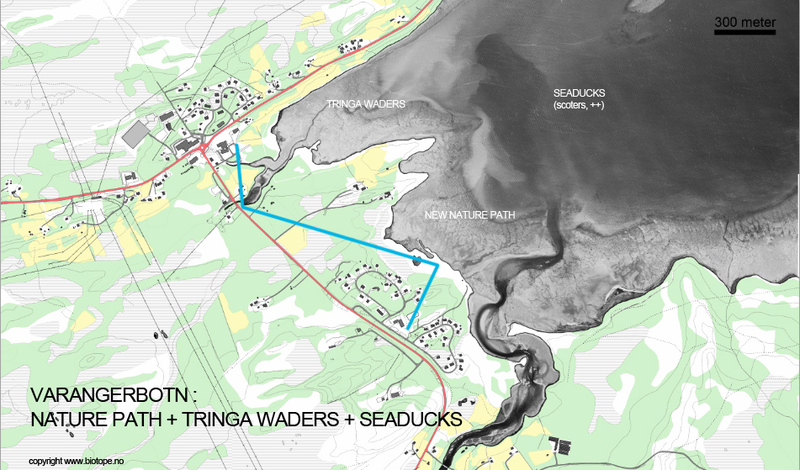 In short - we are mapping everything.. Allways with focus on nature and birds. It is a very rewarding more-then-full-time job. We have covered a lot of ground in this time, allways with an open eye for new and interesting places. Arctic Norway really gives you a sense of wilderness and intact nature, at the same time it is very easily accessible. There are two basic combined reasons for this: The Gulf Stream (simply making it livable this far north), and Norwegian district policy (the will to support living this far north - with almost every modern commodity available). Roughly speaking, this is. 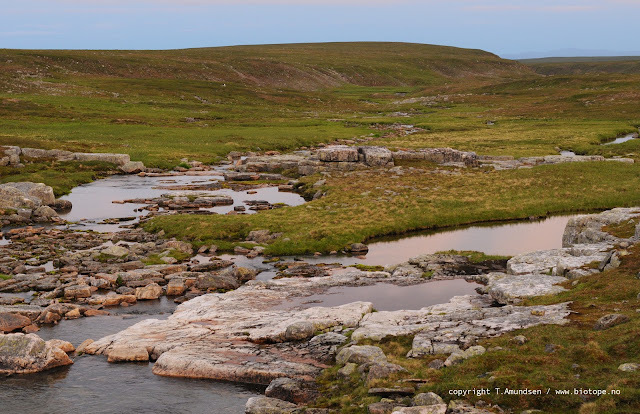 , but there where little evidence of a focus on nature as this kind of resource in Finnmark. The main focus seemed to be the fishing industry, and the fact that this was (is) being literally shipped south by big (and contract-clever) business. Then there is the prospect of the coming oil adventures of the north - and the hope that somehow this business will be run from every town in the north. There are a lot of opinions about this. Our stand is clear - we want to support local ownership and pro-nature businesses. This is more important then short-lived resources. Intact nature - that you harvest (read fishing) is a renewable long-term natural resource. 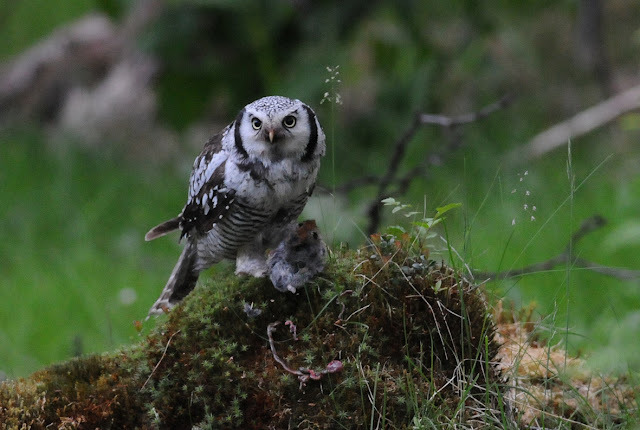 A rich wildlife and birdlife is simply a consequense of sustainable management of nature. 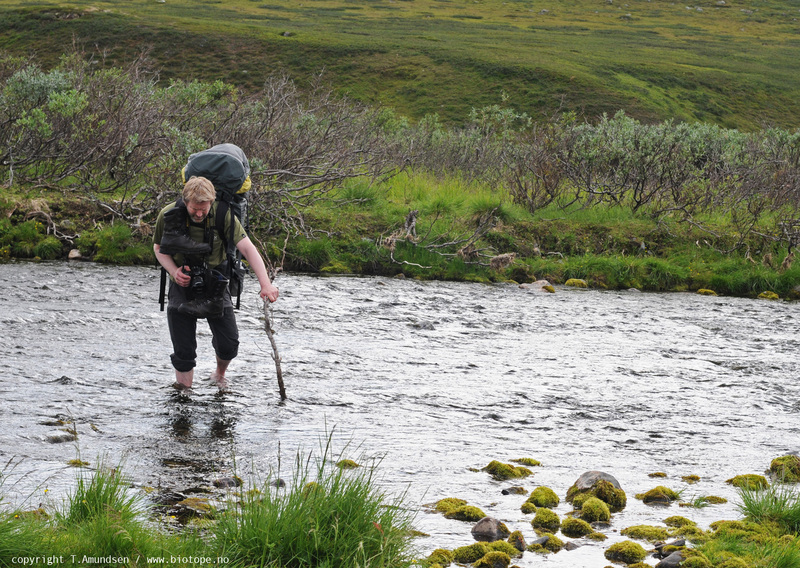 This is one of Eastern Finnmarks advantages and attractions: Very rich natural resources. We are in the business of mapping these. What we register and describe will be used to support local travel / nature based companies, it will inform and promote research, scientific and nature conservation work in the region. We have mapped important bird sites down to a very detailed scale. 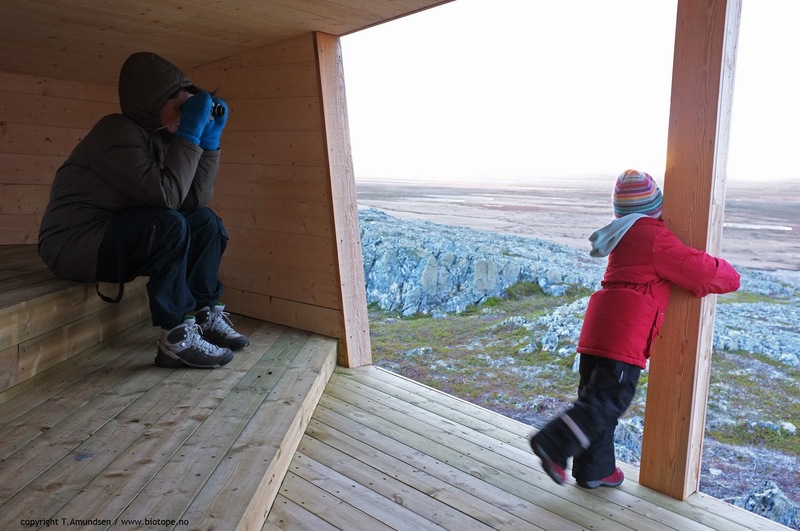 Both from the viewpoint of the birds themselves, and from where you can experience the birdlife best. This is done by countless hours in the field - by car, by fishing vessels, by RIB, by ATV, by kicksled, by foot and by plane. 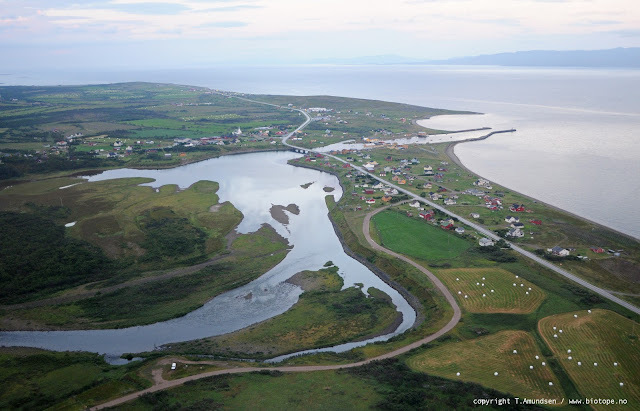 Birds´ view of Skallelv, by the Varanger fjord. The many river deltas and the shallow waters of the Varangerfjord makes it a very productive and bird rich region. 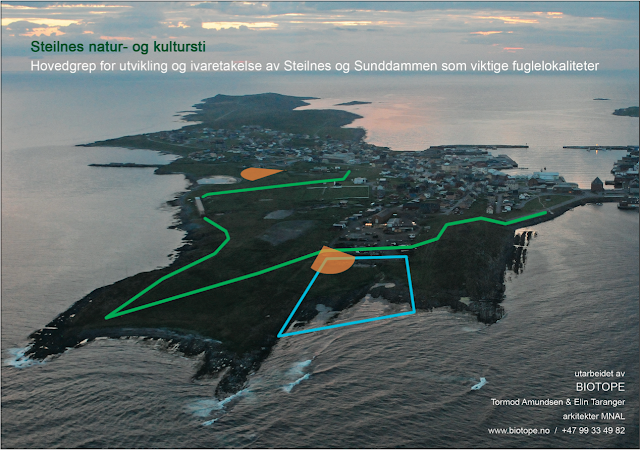 The kelp / seaweed areas (dark parts in sea) is where seaducks such as the rare Steller´s Eiders are feeding. This is where tundra and arctic oceans meet. 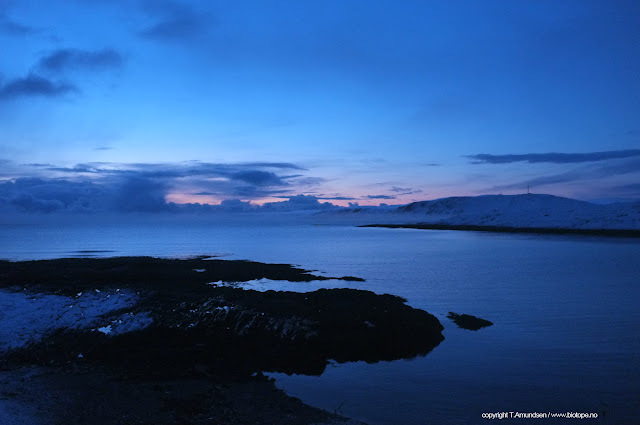 We now have a library of photos and registrations of most key sites on the Varanger Peninsula (and Middle+ Eastern Finnmark), and we are continously working on expanding this library. 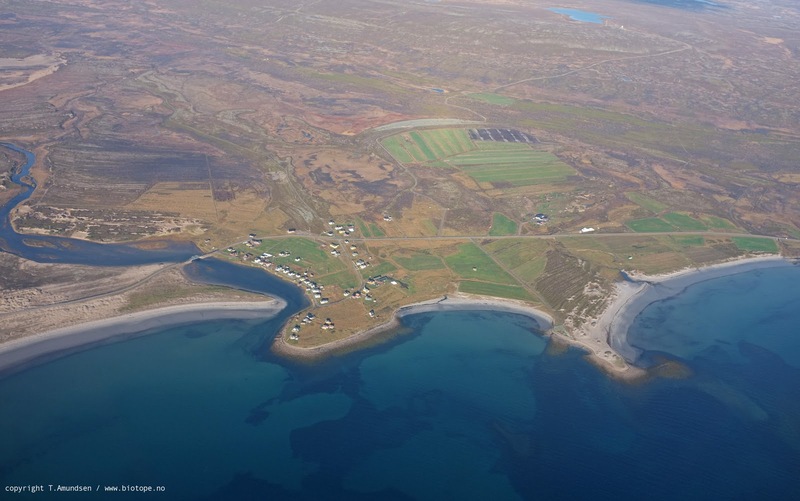 Aerial photo above is from Lillelvneset near Ekkerøy, below is from Vestre Jakobselv / Varanger. Towns are typically placed where natural resources were the best. Nearly all places in Finnmark are based on this (historically important) criteria. Close proximity to natural resource = settlement. Today this is not, and should perhaps not be, the case. We will make a more elaborate article on this subject later. 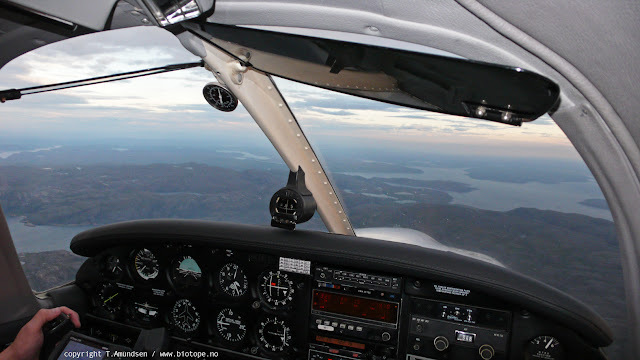 Above is Berlevåg. 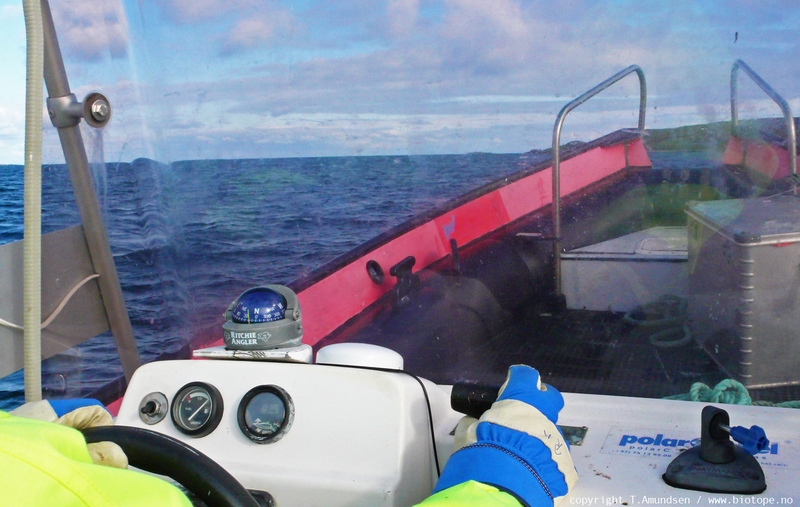 A fantastic place facing the north and with the Barents Sea hammering the breakwater / molo in winter. A well sheltered fishing town with a river delta running into the harbour (and therefore) with an abundance of arctic seaducks and gulls. We have also spent countless hours of birdwatching / registering through the seasons. Keep in mind - this is the arctic, and sun does not mean warm climate. Finding sheltered places is allways a main concern. 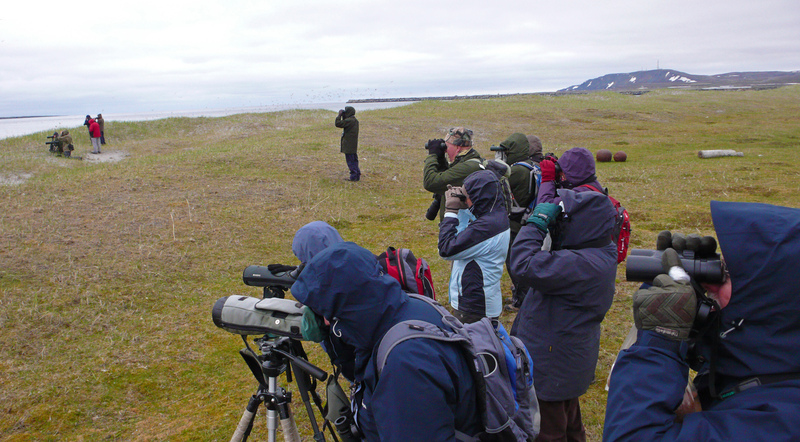 We also do quite a few bird tour guiding gigs. Here we are with a group from Ramblers Hollidays, at the very bird rich Bussesundet, between mainland Vardø / Svartnes and Vardø island, in early june 2011. 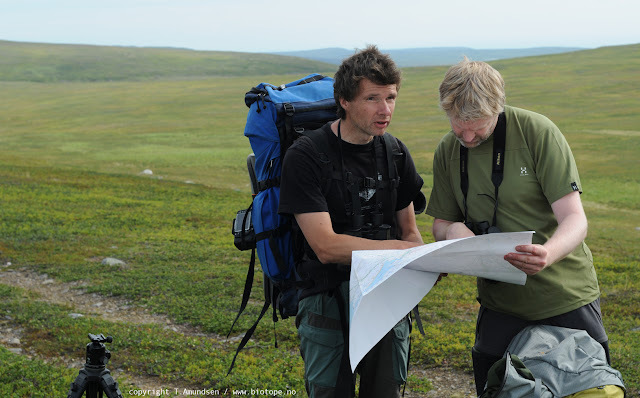 In Varanger there is a shortage for proffesional bird / nature guides. We are working on improving this situation, and if you read this and have ambitions of such adventures (mostly neeeded from april - july), dont hesitate to contact us. Above: seawatching from Nessby-odden. 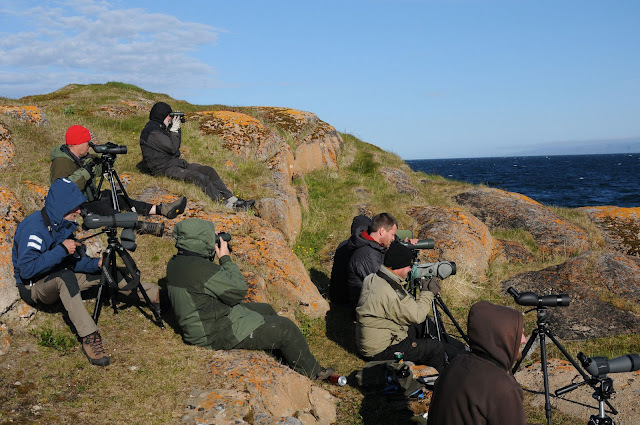 Shelter is important, especially when ´seawatching´ (seabird watching). 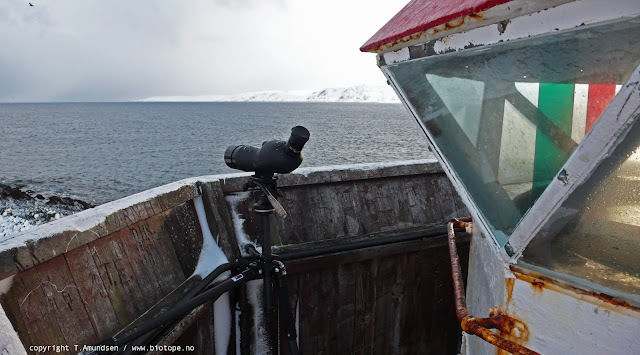 Nesseby is a quite uniqe seawatching site, with several extraordinary records. We have just completed the design of a seawatching hide / wind shelter for this location (most days are not like on the aboce photo). This will be build spring 2012. This is the reward for us: experiencing fantastic birdlife at close range. Far better then any natural history series on TV. Live is better, very alive.. The high arctic seaduck species King Eider Somateria spectabilis above, of which we see rafts of 4-5000 individuals from our office window in winter. 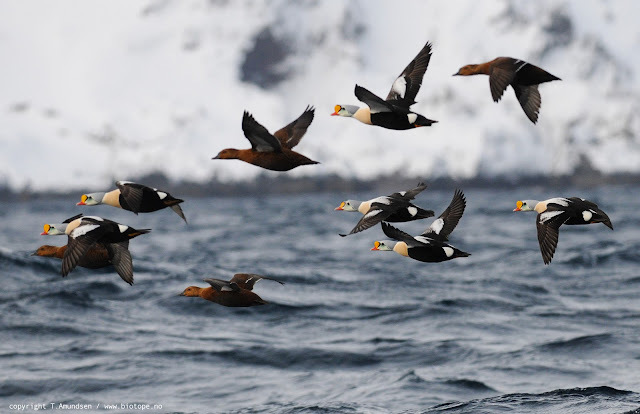 For those interested in King Eider / arctic seaduck photography from boat we can very much recommend nature guide and fisherman, Ørjan Hansen in Båtsfjord. Hawk Owl Surnia ulula - 24 hours daylight steatlh hunter in summer, and in winter with impressive survival skills..
Photo above and below: A section of a 35 000+ individuals swarm of Red Knots (polarsnipe, Calidris canutus), in Porsanger in mid May 2011. Feeding on mussels in the tidal mudflats at Veidnesklubben. 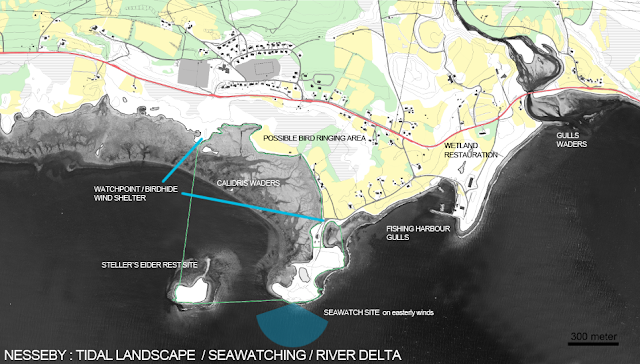 We are currently working on a destination development scheme / project, with a focus on birding and nature based tourism, local initiatives and research programmes. All in all - this combines the best of Varangers natural resources with sensible development and local ownership. We aim to make the right things happen at the right places. Mapping and describing the bird sites are important. For this we have developed a map methodology, that highlights key features. The below maps are still works in progress. We carefully map all key sites, and describe their ecological importance / natural attraction. The Varanger Fjord is a 95 km long great bird site. Exept from a few not so bird rich stretches, this is non-stop bird watching extravaganza. 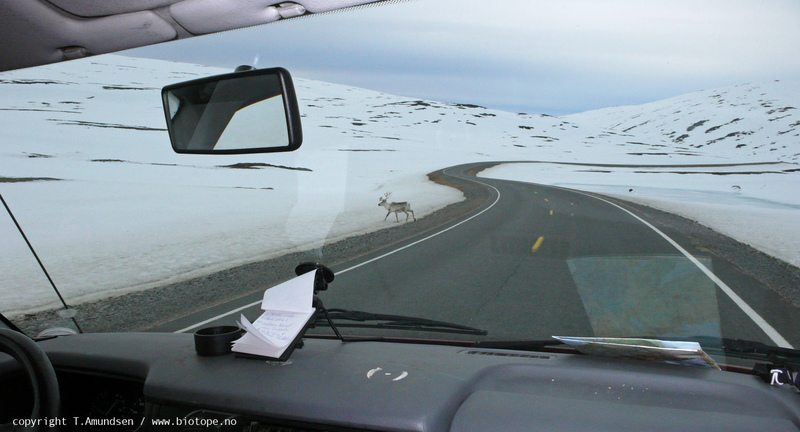 From Varangerbotn to Hamningberg a straight drive takes a little more then two hours - a birder, on the other hand, can easily spend two weeks from Varangerbotn to Hamningberg. Or you can just choose to live here..
More then 30 areas and 40-50 watchpoints have been registered, and mapped. There is a wide range of qualities that define the various places. Some of the local tourist companys are very strategically places for birding. For us it is also important to make nature accesible to the local community. When designing a bird hide / wind shelter, or a nature trail we aim to make this beneficial for local schools / communities. The Varangerbotn nature trail / path is such a project (above/more to come). Describing the ecological qualities in a way that is easily understood is important for us. Beiing architects we find that visually communicating our finds and ideas are very effective. Especially in the north, where people are quite used to reading maps, we try to make ours pinpoint birding and ecological viewpoints. 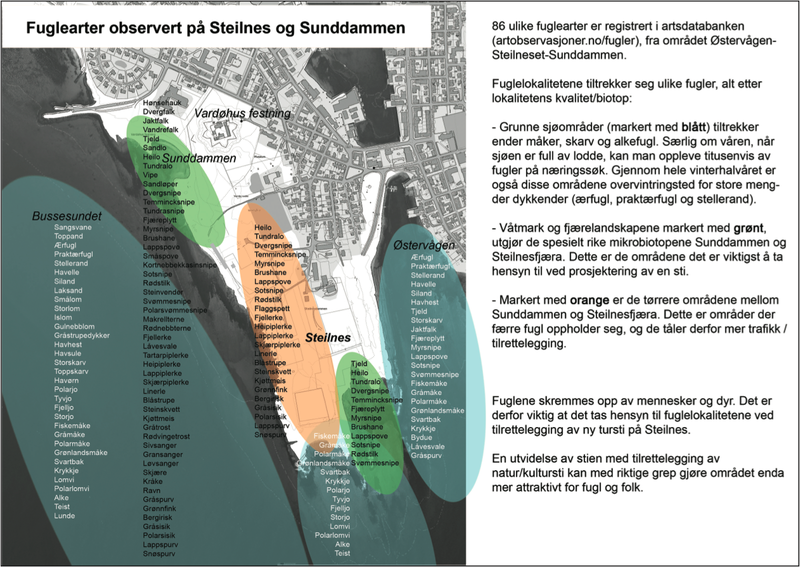 (f.ex we made the ´Hornøya nature reserve map´ based on drafts / sjøkart, which many are familiar with, and can more easily relate to). 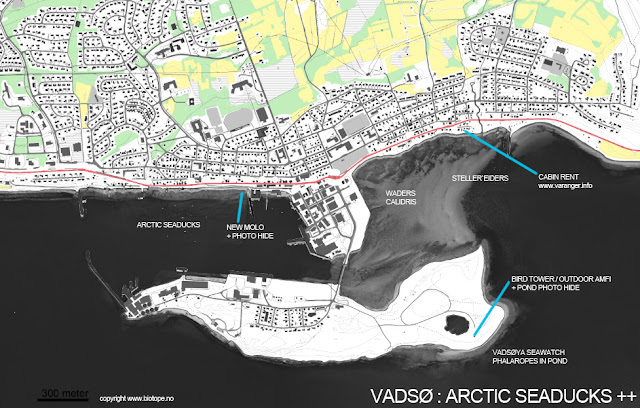 The above map (from another case study) show a nature trail, with strategically placed bird hides / wind shelters, in Vardø (made on commision from the National Tourist Routes in Norway). 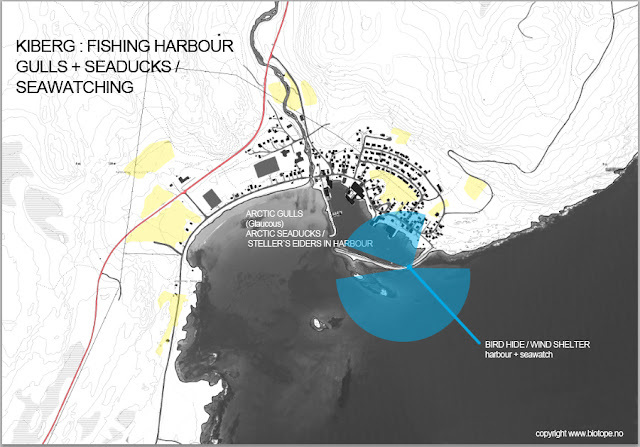 Each wind shelter or bird hide we propose is designed based on a range of criteria, from sightlines and wind directions to stability and more.. Each project and site requiers a different solution (note: sometimes the best solution is doing nothing..). 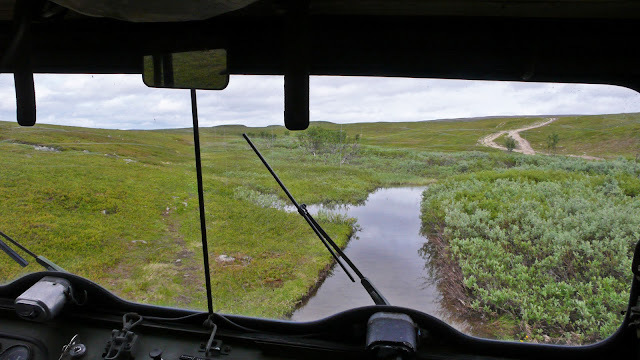 Below is Barvikmyran wind shelter, with a view of the arctic tundra. A fantastic tundra marshland .Staying there for longer then minutes without shelter is rarely a pleasant experience, even in summer. The new hide makes this place accesible / enjoyable. Photo is taken in september. We register basically everything, but there are still a few experiences that we keep of the map. The privilege of living in Finnmark finally brought us to this experience: This summer was one of the best lemming years for a very long time. Owls and raptors had a great season. 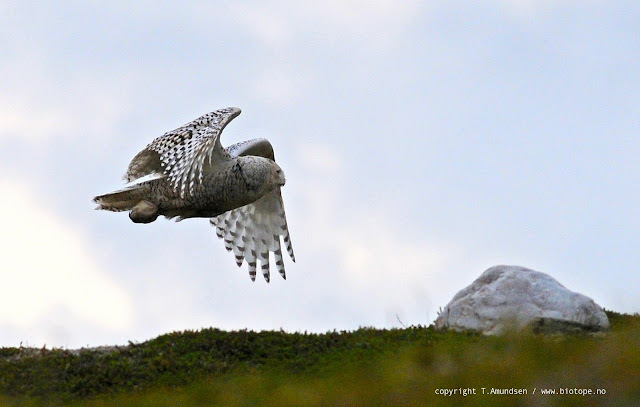 Seeing Snowy Owls have been a dream for a long time. It is truly a high arctic species. They are birds that do not share land with people. Finding these birds are not a matter of course - or rather it is very off course. 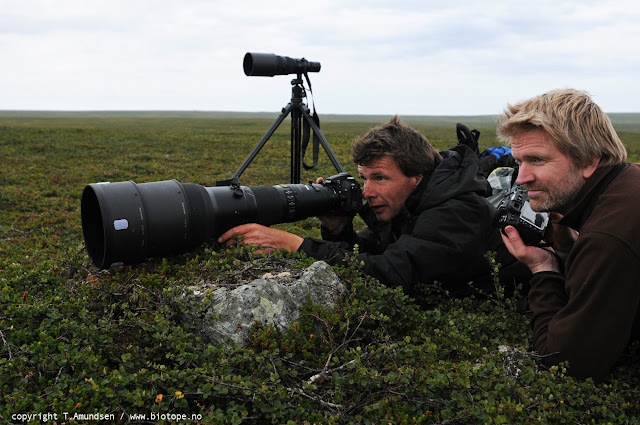 This summer I teamed up with Varanger photographers Bjarne Riesto and Knut Sverre Horn. 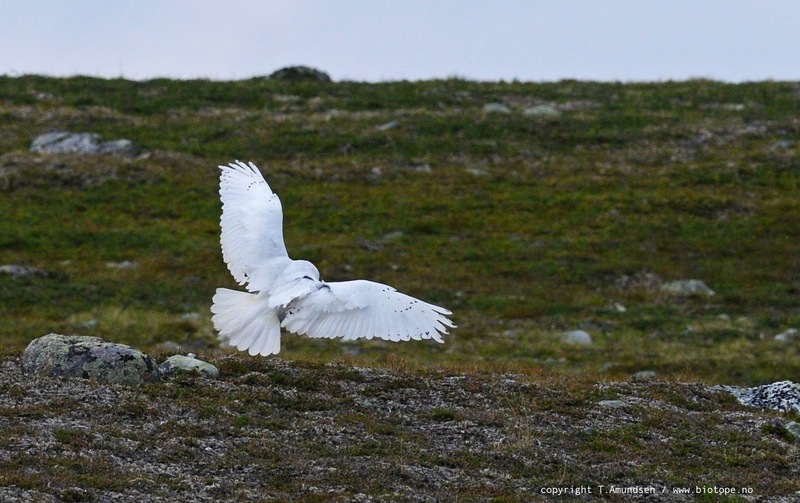 We had good information on where to go to find these birds, that are known to breed in Finnmark every year, but very sporadically. 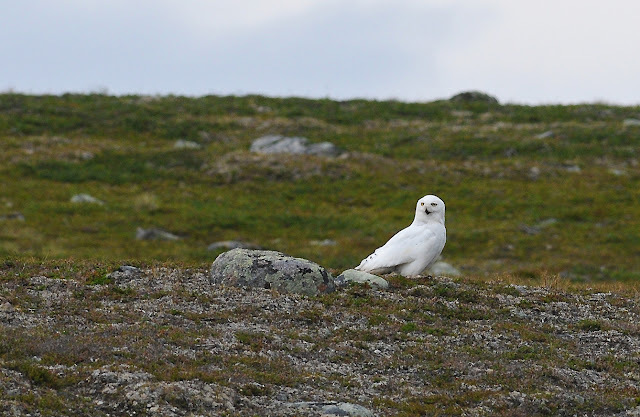 This experience stays off the map, but in Finnmark you can allways be lucky and and see a Snowy Owl flying by, but going out there to look for them is really a needle in haystack job. Vast and sloping high tundra landscape, accesible only by foot is not a somtehing-to-do-before-lunch-experience. We had luck with the weather (it could just as well been a snow showers - even in july). I will be unspesific about this, but walking was considerable.. Snowy Owls had a fantastic year in Northern Norway, with approx 40 breedings confirmed! A once in a life time experience. We saw several birds, and even confirmed a new breeding pair. 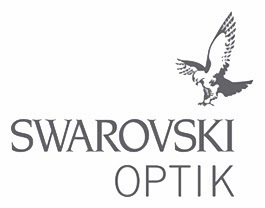 Our registrations was forwarded to the Snowy Owl project, and none other. This is after all a rare and endangered species. We spent little time in the birds territories. We kept our distance, got a few photos, and basically stayed at very good distance and viewed the magnificent birds through the telescope. A female below. See the white spot a little to the left about 1/5 down from top of photo? 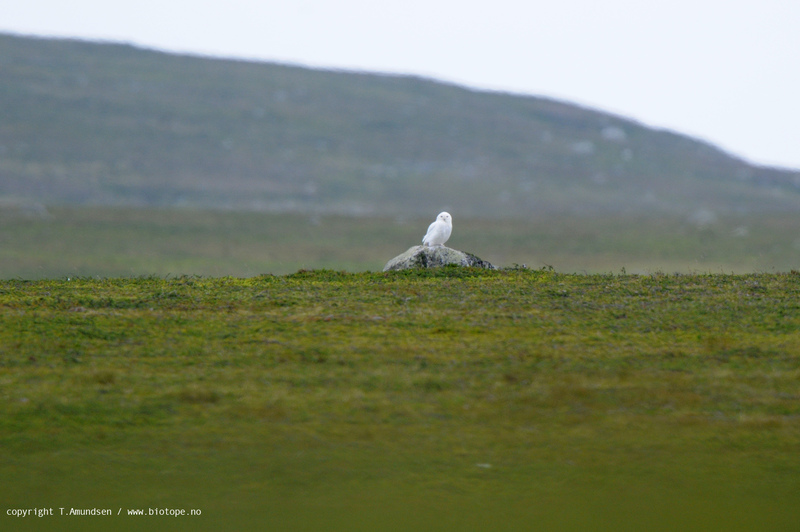 Snowy Owl on the high tundra, midsummer night. 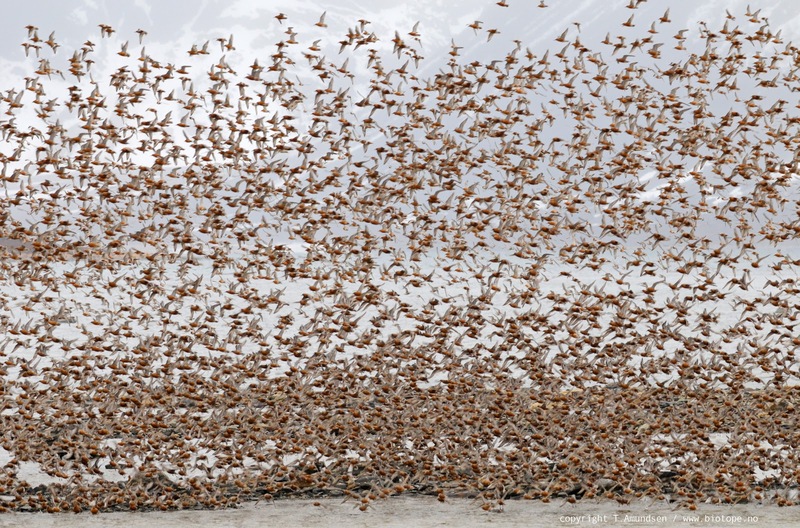 Few other bird species live where they live - it is really a off limits bird species.. 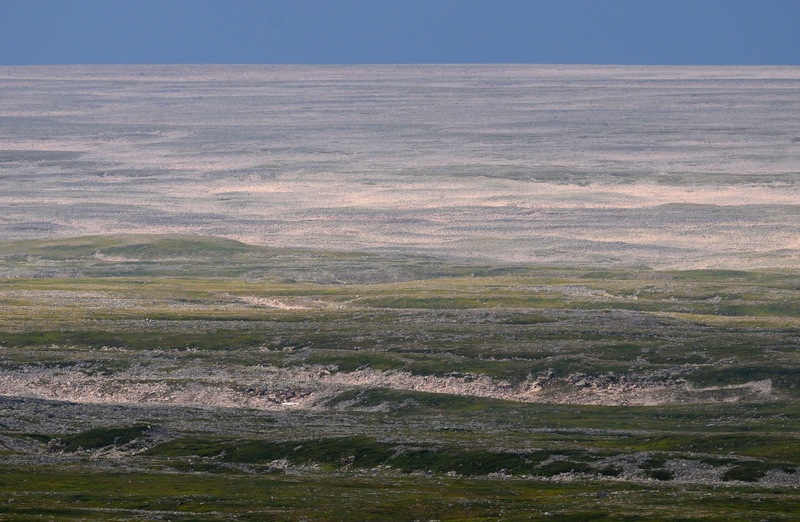 This is the their landscape - the arctic high tundra. Not somewhere you just stroll around hoping to see something. 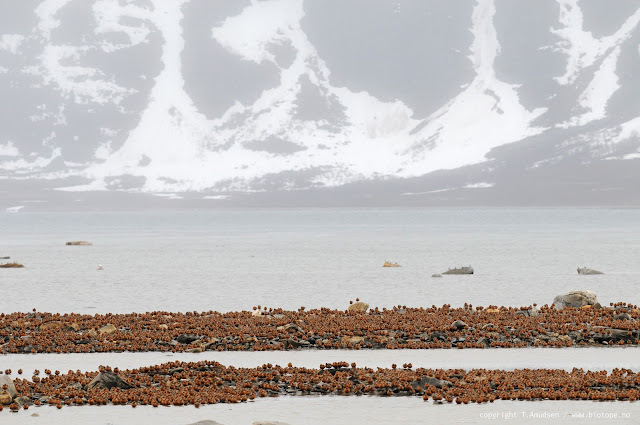 By the way they hunt by sitting all quiet on a rock, moving only when necesarry - a quick lemming snack will do.. Now, beiing that Finnmark is roughly the size of Denmark, patience is absolutely needed. A couple of years, or so.. Still birding in Eastern Finnmark / Arctic Norway is a fantastic experience! Gyr Falcons, King Eiders, Steller´s Eiders, Sea Eagles, Alcids, great numbers of waders, Taiga birds and much more is spectacular. 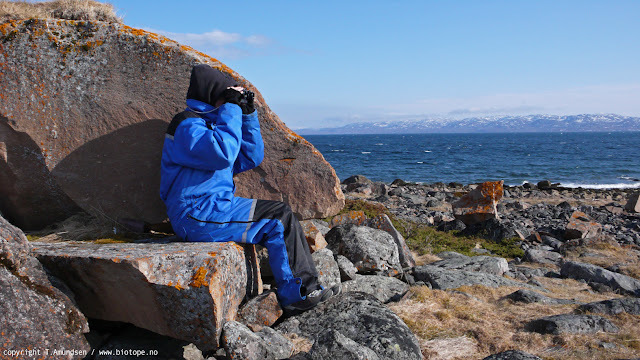 We have already made a destination study for the northern part of the Varanger Peninsula: A detailed study on sites and birds in Kongsfjord and Berlevåg. 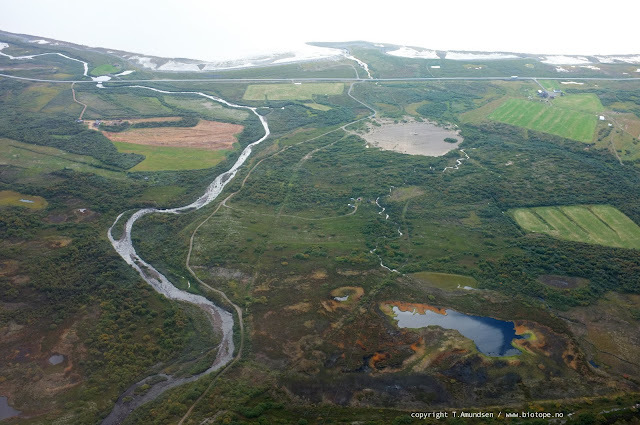 We are now completing the Varanger Peninsula with a study on sites, birds and possibilities in the rest of the peninsula. Below is the first and last page of the 50-page destination study we did in 2010. 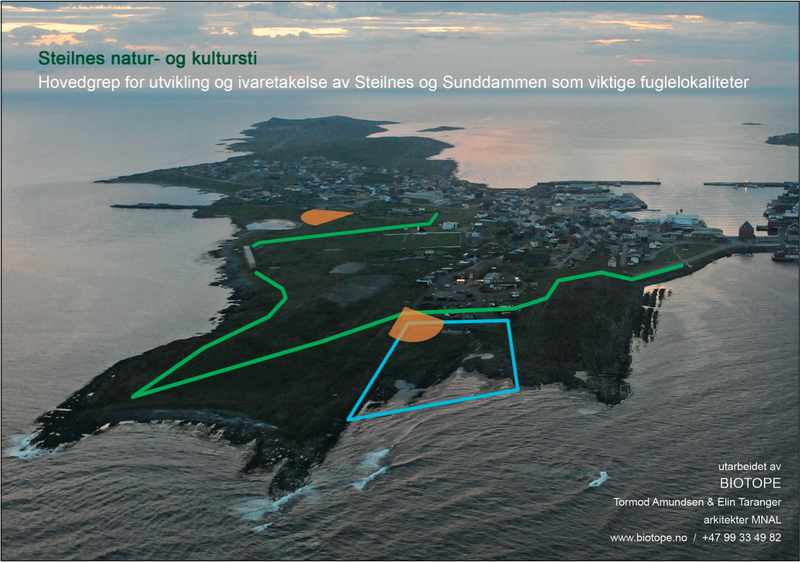 We are now producing the ´Varanger Peninsula - birding destination study´. It will be finished in mid february. An update will follow on the coming seminar / `Varanger Birding Destination Workshop´. Meanwhile - this is what the dark season looks like at its brightest: View from the Biotope office at mid day, desember 12, 2011. A good time of the year to do the design / office work.. Even with only a few hours a day with twilight (and 20 hours pitch black), there is still birds around. The Gulls in Vardø harbour is mentioned in a previous article, but more impressive is the very tough and hardy Purple Sandpiper Calidris maritima. 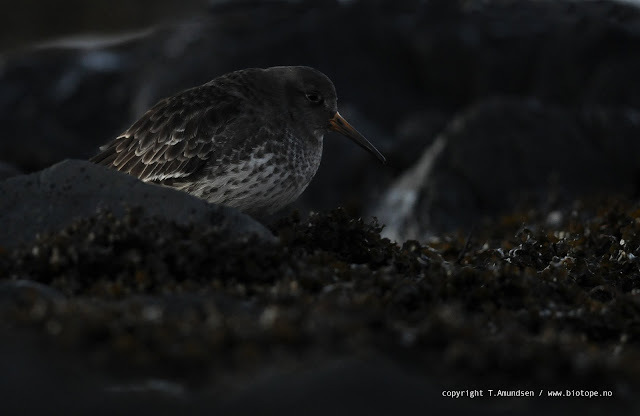 When every other sandpiper species leaves for Africa in the autumn, this bird stays. Seemingly thriving in the winter storms. A truly remarkable little bird. Photo below is from the shore on the photo above. 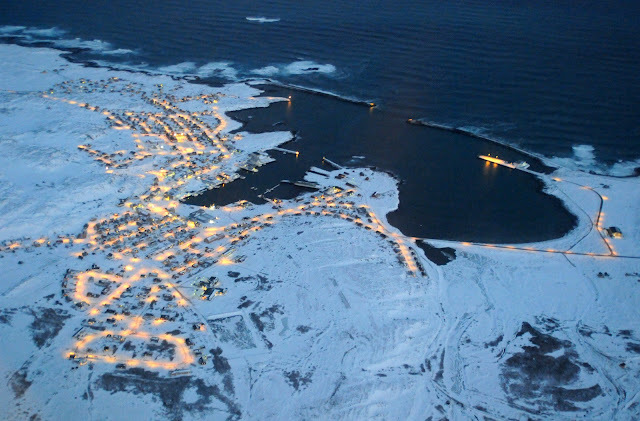 By the way - the Steller´s Eiders arrived in their favourite harbour of Vadsø a couple of weeks ago. 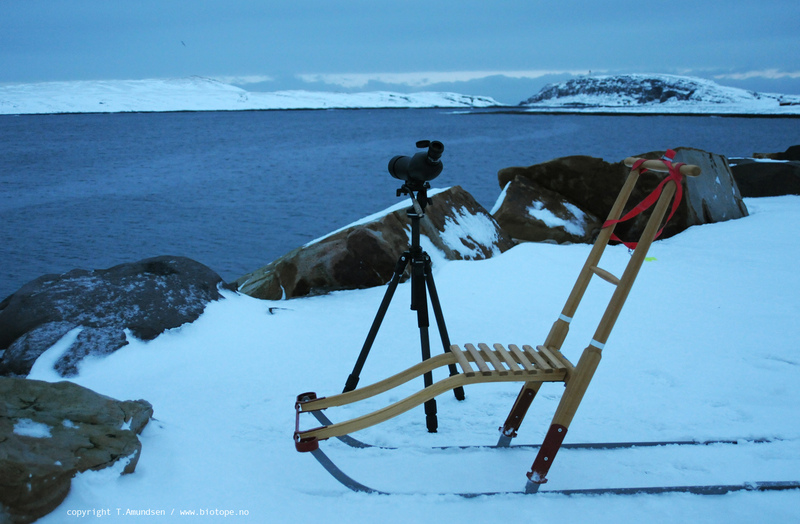 We are expecting the King eiders in Vardø anytime now. More articles from the northeast will follow..
Below is a very short timelapse video shot with Ipad from the Biotope office window two days ago. This is the two twilight hours compressed into a few seconds.. The rest of the day/night is pitch black. Just waiting for the snow to settle, and the arctic seaducks to arrive. 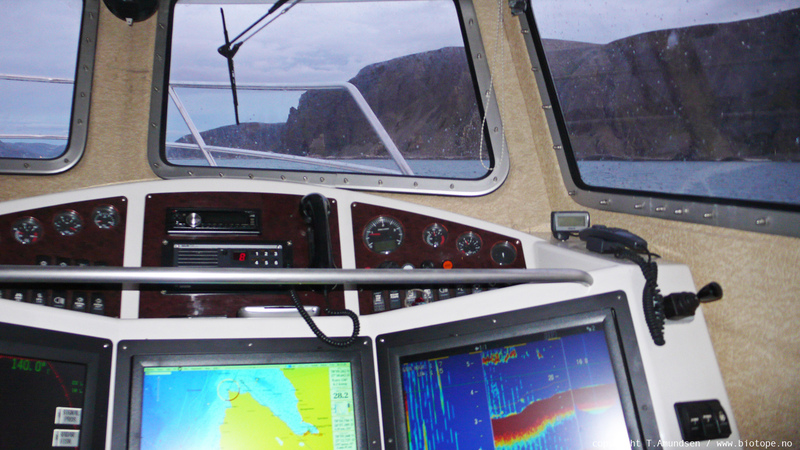 Meanwhile we will make maps and finish our Varanger Peninsula study. To be continued..